Geographic annotations on AS links. The Internet arises from the interconnection of thousands of independently operated networks. 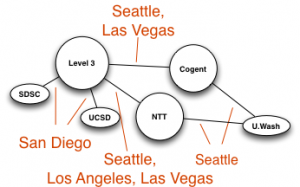 Its structure is often modeled as a collection of Autonomous Systems (ASes), nodes, exchanging traffic across interconnects, links. These models are reductive by nature, with large international organizations made up of thousands of machines and cables reduced to a single node, and multiple exchange points reduced to a single link. We extended this model with the introduction of geographic locations attached to links between ISPs, represented by ASes. 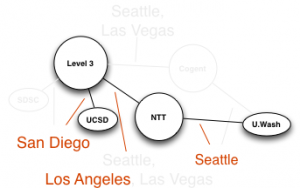 This extension maintains the simple node and link structure of the AS graph, and allows us to capture some of the geographic complexity in the topology. AS graphic with geographic locations. Consider the path from UCSD to U.Washington depicted in the illustration above. Level 3 has two possible paths: Level 3 ➡ Cogent ➡ U.Wash and Level 3 ➡ NTT ➡ U.Wash. Both paths have the same AS path length. 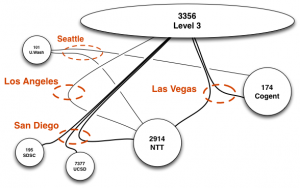 Assuming Level 3 uses hot-potato routing, in order to spend as little money on carrying traffic as possible, it transfers the traffic as soon as possible onto another provider. In this example, NTT’s Los Angeles connection is closer to San Diego than Cogent’s Las Vegas connection, so Level 3 chooses to route the traffic through NTT. 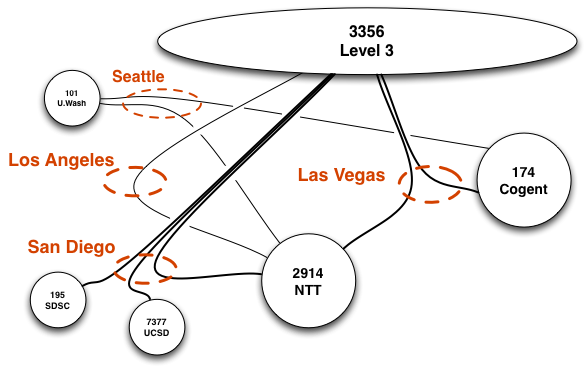 In addition to supporting research on path prediction, these type of geographic annotations of links can provide a more realistic indication of the network’s resilience to link failure. In the figure below, duplicate links between ASes reflect multiple interconnects between ASes. e.g., this figure implies that a single link failure would disconnect UCSD from Level 3, while three links would have to fail for Level 3 and NTT to become disconnected. Shows multiple links between ASes that connect in multiple locations. Details on our geographic link annotation methods and this data is available at CAIDA’s AS Relationships with geographic annotations page. This entry was posted on Tuesday, September 20th, 2016 at 10:04 pm	and is filed under Commentaries, Topology, Updates. You can follow any responses to this entry through the RSS 2.0 feed. You can skip to the end and leave a response. Pinging is currently not allowed.